Mere days after former Vatican ambassador to the US, Archbishop Carlo Maria Viganò, alleged that the Pope was aware of sexual misconduct allegations against Cardinal Theodore McCarrick, Francis is said to have been spending a large part of his day quietly trying out different new emeritus signatures in preparations for his upcoming retirement. 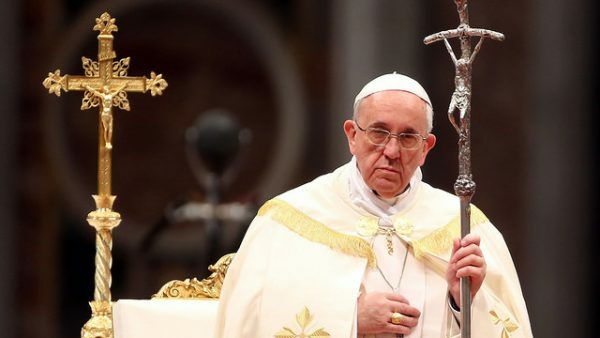 “I hear you get a gold-plated watch,” Pope Francis whispered into the ear of one reporter in an attempt to change the subject of the accusation while in route to Rome from Ireland. But when the reporter repeated the question, Pope Francis was said to have pointed behind everyone, yelling, “Hey, what’s that!” before running back to his seat. One of Francis’ aides, Father Tomas Demarco, told EOTT this morning that the Pope spent the rest of the flight trying out different signatures with “emeritus” in them. Demarco said that when Francis returned to the Vatican, he went up to the window in his bedroom and “Just stared out onto St. Peter’s Square.